The FOCD-H converts Ethernet 10/100 BaseT to 100FX or Gigabit Ethernet 10/100/1000 BaseT to 1000SX/LX. 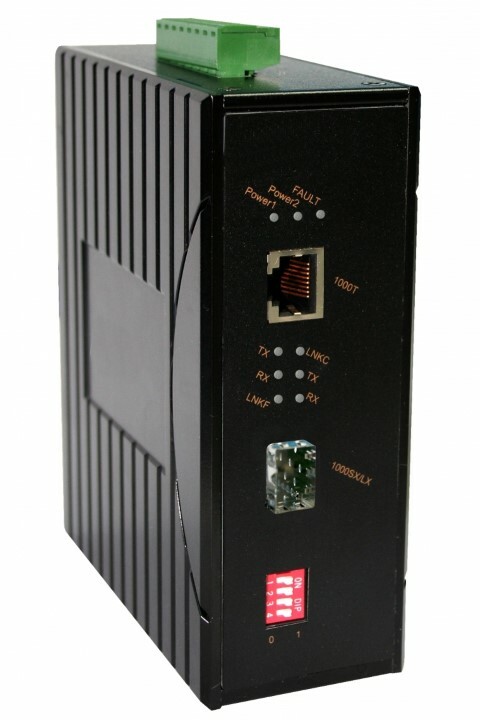 The FOCD-H is a powerful automatic Ethernet media converter for industrial environment. It is a hardened device in a IP30 DIN-rail enclosure with –40 °C to +75 °C operating temperature range. The FOCD-His used to interconnect any vendor Ethernet or Gigabit Ethernet equipment from their copper or fiber interface. It may be used especially in severe environments to extend a LAN over an optical link. Automatic speed and full/half duplex mode, “Link Pass Through” or “Link Alarm” feature can be set by dip-switches. The FOCD-Hcomplies with the electromagnetic EN61000-6-2 and vibration and choc IEC60068-2-6/27/32 standards.